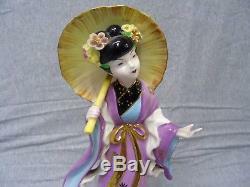 2 - 1950's Vintage Lefton Oriental Geisha with Parasol / Umbrella Figurines. 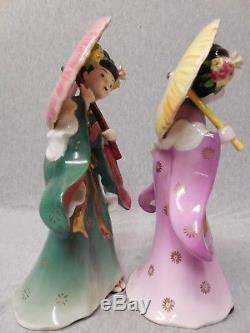 They are beautifully dressed in Green and Mauve with an applied flower. On the bottom of each is the Lefton Red and Gold Label that reads "® LEFTON EXCLUSIVES JAPAN". Please look at all the photos. Se the zoom feature available to examine the item. A big part of our description. If we miss something or fail to describe something, hopefully our Photos will catch it as we try to show every possible view of the item. Hide anything about the item. And ask us about it. Lease note that color might vary from one computer to another. 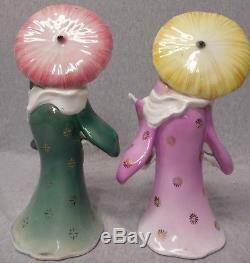 We sell a lot of vintage items or items several years old. We sometimes consider them to be in Excellent Vintage Condition if they are not cracked, repaired, or any other damage due to mis-use. Tems such as these can have some imperfections which we will point out if we can. 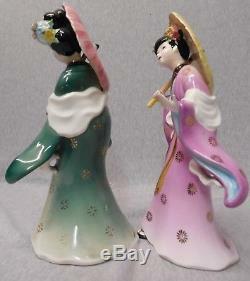 Excellent Vintage Condition does not mean they are in mint or perfect condition. Please take note that we are not experts on collectibles or on all the items we have listed. We just try to describe them as best as we can and to the best of our knowledge. All E-mails will be answered within 12 hours. Your complete satisfaction is our top priority. Make sure your ZIP CODE is in the box to the right. Also its the buyers responsibility to make sure we have your correct mailing address. These charges are the buyers responsibility. 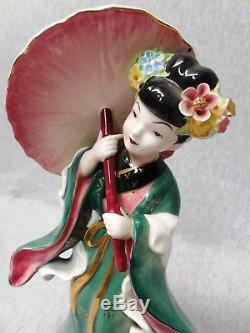 The item "2 1950's Vintage Lefton Oriental Geisha with Parasol / Umbrella Figurines n148" is in sale since Tuesday, April 03, 2018. 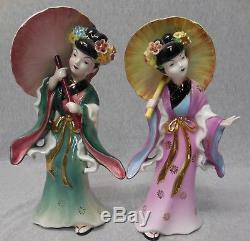 This item is in the category "Collectibles\Decorative Collectibles\Decorative Collectible Brands\Lefton Figurines". The seller is "chukiebear" and is located in Palos Heights, Illinois.